Ciprian Hopirtean came to us early, and started working by the middle of June. He was one of the longest remaining sculptors who extended their stay even after the end of the Symposium. Always smiling and a very enthousiastic person with everyone, the most common of the phrases you’ll hear from him is “No problem”. He uses this common phrase in such an extent that it is said among the sculptors that when Ciprian recognises a problem in a situation the world will end! Handling volumes of marble extremely hard to work, and delivering excellent pieces out of them can be mentioned as one of his talents. As most of the sculptors we worked with, so is Ciprian good in a variety of arts apart from sculpture; he produces very interesting expressionistic sketches, miniature terracotta statues, and he is particularly keen on canvas restoration. A brand new series was inspired by the symposium shown in a solo exhibition in Myrό Gallery of Contemporary Arts in November 2014. The exhibition has been a major success; they were acquired by a single collector, and the exhibition hit the roof in terms of visitors, who vastly left excellent comments on the new series. Ciprian Hopirtean is also one of the first sculptors to embrace and participate in the Greek Marble Initiative platform and projects. And in the Initiative we have every reason to be proud for this. Ciprian is now at work on his latest sculptrure. 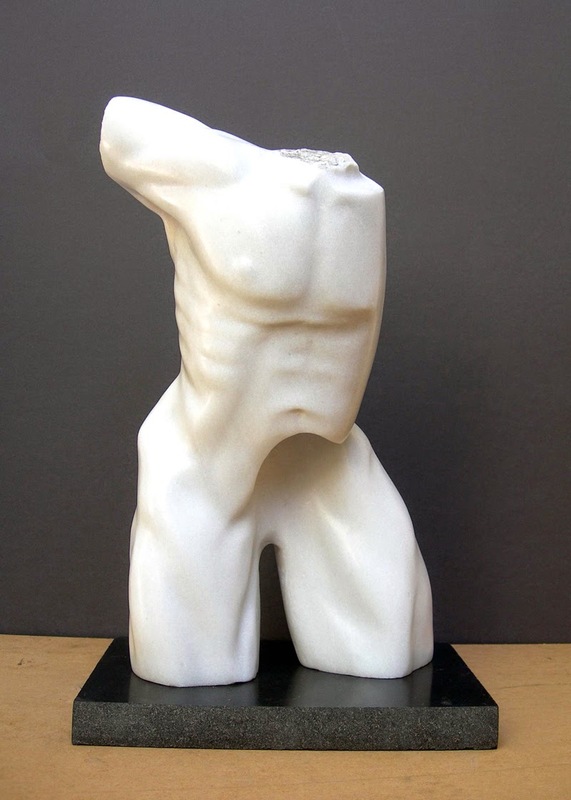 In addition we are excited for the acquisition of Ciprian's latest series of sculptures. As the historian and theoretic of Arts Thouli Misirloglou writes in an article, “Hopirtean's sculpture manage volume in a rhythmic manner, followed by form, lines and a harmonious juxtaposition of binary formats”. Ciprian Hopirtean born in 1977 in Aiud of Romania. In 2008 he graduated from the Fine Arts Department of the School of Fine Arts in Oradea, Romania. His expertise covers two fields: painting and restoration of paintings. He is a member of the Association of Visual Artists of Northern Greece (SKETVE). He has shown his works in 10 personal exhibitions. He also took part in many group exhibitions both in Greece and abroad. He lives and works in Thessaloniki. The depicted works are the ones sold through Myrό Gallery of Contemporary Art, in Thessaloniki, Greece. View all of his works created within or for Greek Marble Initiative, with full details HERE.